Calculate MIPS Score: MIPS calculators that calculate MIPS score (Composite Performance Score or CPS) on a 100-points scale based on the Quality, Promoting Interoperability (formerly ACI) and Improvement Activities (IA) categories. Calculate Payment Adjustment: MIPS calculators that calculate the payments adjustments in dollars based on MIPS score (CPS) and other factors that we will talk about. Calculate Quality Scores: MIPS calculators that are offered by EHRs or Registries that calculate Quality Scores only with limited analytical capabilities. While the rules for the calculation of MIPS score are well defined, calculation of payment adjustments involves a LOT OF ASSUMPTIONS. In most cases, it is not possible to accurately calculate the adjustment amount. We all respond better to dollars than scores. Therefore, vendors are trying to show the financial impact of MIPS for providers in some way. Before you go ahead and make a decision to utilize a MIPS solution based on demo of payment calculations, you must winnow fiction from the facts. Let’s do that. While there has been changes in the measures, benchmarks, bonus points, and scoring pertaining to all performance categories, CMS has provided guidelines and resources regarding calculation of all the category scores and the MIPS score. The feedback reports based on 2018 performance that will become available in 2019 Summer would provide a better estimate for the Cost category. Also, practices will get a better idea of the Complex Patient Bonus towards the end of the year, based on the number of their patients who fall in the Hierarchical Condition Categories (HCC) and are Dually Eligible (Medicare and Medicaid). MyMipsScore breaks down this complex process of MIPS score calculation into 10 simple steps for providers. If you do not plan to do anything for MIPS in 2019, you can accurately estimate your annual negative payment adjustments for 2021. You don't need a MIPS calculator for that. A simple calculator is all you need. Just calculate 7% of your estimated Part B payments in 2021. This is the amount that you will loose on your 2021 reimbursements if you choose not to participate in MIPS or participate minimally and earn a MIPS score of 7.5 or less (1/4th of performance threshold). The performance threshold for 2019 has been raised to MIPS score of 30 (from a score of 15 in 2018). The negative payment adjustments will be based on sliding scale from -7% (for MIPS score of ≤ 7.5) to 0% (for MIPS score of 30). If you don’t plan to do anything for MIPS in 2019, you will have a negative payment adjustment (-7%) on your Part B payments in 2021. If you plan to do something – keep reading. From 2019 onward, little more effort will be required to avoid a penalty in 2021. You will need to earn a MIPS score of 30 or more. Although CMS will calculate your Cost category score (max score of 15) on the applicable measures (case minimum met, and applies to your specialty), the exact score can’t be predicted in advance. You can submit the data for just the Quality performance category if you are able to earn a Quality score of ≥ 30 using measures from a combination of collection types. You can report 2 eCQMs, 3 MIPS-CQMs, and 1 Claims measure. PI category alone might not be enough in 2019 (max score of 25). Additionally, the PI category has been completely restructured making it significantly harder to earn a 100% score. Bonus point opportunities have also been reduced, while 2015 Certified EHR has been made mandatory. The small practice bonus (6 points) for practices with 1-15 eligible clinicians has been moved to the Quality category. There are 118 Improvement Activities available for reporting in 2019, and maximum points can be achieved by submitting data for any 90 continuous days. You can mix and match the different performance categories to get to MIPS score of 30. However, if you pick this option, you will be leaving money on the table. MyMipsScore MIPS Calculator allows you to estimate how much bonus you could earn based on your estimated MIPS score and expected Medicare Part-B payments. If you aim for a MIPS score of greater than 30, keep reading. This is where the fiction story starts with most of the calculators. Let's take a closer look at positive payment adjustment calculation process to understand the factors involved. In addition to the budget-neutral part, CMS has earmarked $500 million annually (2019 – 2024) for exceptional performers. For 2019, the exceptional performance threshold has been set at MIPS score of 75 that needs to be crossed to become eligible for this positive payment adjustment. As per the final rule, a minimum of 0.5% payment adjustment would be awarded at the threshold (MIPS Score = 75). The final adjustment percentage will depend on how all the MIPS eligible clinicians perform. After every one has submitted their data and CMS has confirmed the MIPS scores for 2019 reporting year, CMS will calculate a Scaling Factor for the two adjustment components mentioned above for the year. The final positive adjustments will be based on these scaling factors (which we are referring to as SF1 and SF2 for the sake of clarity). SF1 ensures a budget-neutral distribution of the positive payment adjustment for MIPS scores from 30.01-100 of the penalties collected from the providers with MIPS scores less than 30. It is really important to understand that the numbers CMS used in the Figure 3 below of the 2019 Final Rule are just estimates. Actual numbers may vary based on the performance of eligible clinicians. SF2 will be used to ensure equitable distribution of $500 million between all the exceptional performers i.e., higher score will earn a higher payment adjustment. SF2 will be based on the number of exceptionally performing clinicians. Providers who reach this threshold (MIPS score=75) would be awarded a minimum of additional 0.5% exceptional performance payment adjustment. At this time, both the scaling factors are unknown. The only realistic estimate that we have from CMS is that in 2019 fewer providers would cross the Exceptional Performance Threshold (MIPS score of 75) due to multiple changes in MIPS requirements. As a result, the bulk of the incentives would lie in the exceptional performance score range (75-100). A maximum incentive of 4.69% is estimated for a MIPS score of 100. The Figure 3 below from the 2019 MACRA Final Rule depicts the estimated movement of payment adjustment taking into account both the budget neutral payment adjustment (referred to as Adjustment Factor) and the exceptional performance payment adjustment (referred to as Additional Adjustment Factor). How Are MIPS Calculators Showing Payment Adjustment Estimates Then? The payment adjustment calculations in the available MIPS calculators are based on a set of numbers used by CMS in an example in the final rule. For 2019 performance year, to be eligible for MIPS, clinicians must exceed the the Low Volume Threshold of $90,000 in Medicare Part B billings AND 200 patients AND 200 Covered Professional Services. While 6 new eligible clinician types have been added, some of the eligible clinicians might be excluded based on their QP or partial QP status by virtue of being Advanced APM participants. Thus, it is unclear at this point how that might impact the payment adjustments. If you need to earn a MIPS score of more than 30 to be eligible for positive payment adjustment. 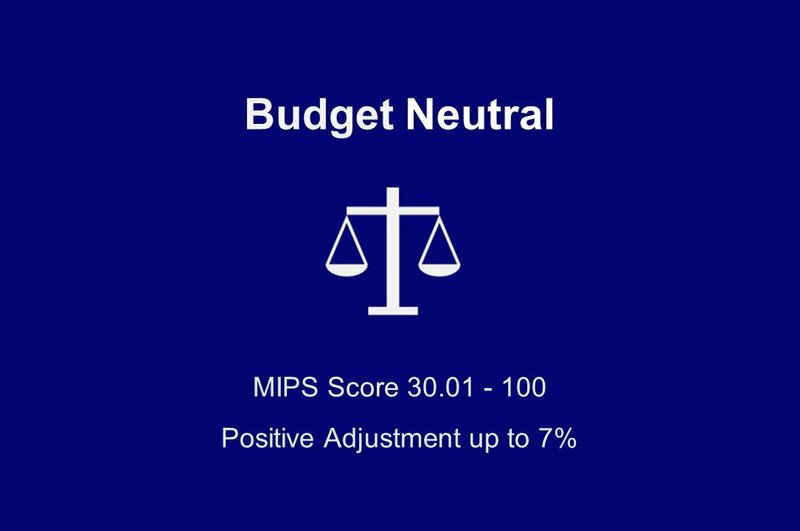 If you are exceptional performer (MIPS Score ≥ 75 for 2019), you will earn a bonus positive adjustment ranging from 0.5% -10% in ADDITION to the budget neutral payment adjustment. The variation in the positive adjustments could be vast. Don’t get carried away by calculators that are based on fiction. The final payment adjustment hinges on the two Scaling Factors which CMS will be able to calculate only after the end of submission period for 2019 (31st March, 2020). We can speculate all we want, but there is no way to know how thousands of providers will perform. The only thing you can do, is to maximize your MIPS score. Don’t forget the non-financial impact of MIPS score. Your MIPS score will be publicly available on the Physician Compare website and as downloadable database that will affect your professional reputation. MyMipsScore is all about helping you make informed MIPS decisions that drive your MIPS strategy. Our focus is to help you understand, analyze and maximize your MIPS score. However, we recognize that practices need to get an idea about how much money is at stake to get decision-makers and providers jump into action. MyMipsScore's calculator is designed to do exactly that. * MyMipsScore calculator is based on the assumptions and Scaling Factor estimates used in the 2019 Final Rule that were explained above. Interested in Using MyMipsScore for Your Organization?